W3C Group participants, members of the W3C Team, and Office Staff are invited to add new talks whenever you may be making presentations on the work of a W3C Group (see April 2003 announcement) or W3C work in general. In addition to adding your talk, please consider adding the event to the W3C Events calendar, or particularly important ones. The W3C Events calendar typically includes work group f2f meetings, conferences that W3C partnered with to promote, or events that are in our best interest to promote (feel free to coordinate with MarComm to determine this). Members of the W3C Team and Offices staff may do so via the Events Manager tool, others should share the event information via w3t-pr@w3.org to request W3C Comm team adds it. The following information describes how to add a new entry to the talks database. First, log in to the website using your W3C credentials. Once logged in, you should see an “Events” drop-down menu at the top of the page containing an “Add Event” entry. In the form that appears upon clicking on that link, you can enter the title of the new talk as well as its abstract or description. You can add links, upload images or embed videos there. Below that main text area is “The Event Calendar” section. There you can specify when and where the talk will take place, as well as who organizes it. Use the “Location” section to select or create a venue. This can be the conference or event name, using the physical address and URI of the event. Leave “Show Google Map:” and “Show Google Maps Link:” checked. 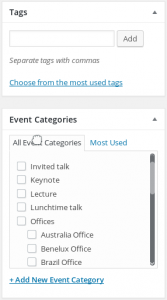 Further down, the “Additional Event Fields” let you add more information about the talk. 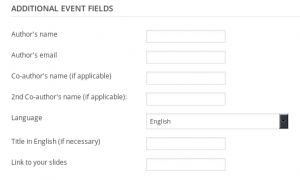 Finally, you should add one or several tags and categories from the right-hand side of the form, and select an office if the event is organized by a W3C Office. Not seeing it? If so, it is likely you created a new Post, whereas Event is desired.